Providing a healthy and clean hospital environment ensures the well being of your patients, visitors, and employees alike. Shiny floors, clean glass, and spotless corners is what patients will remember when completing the HCAHPS survey and should all be part of your Medical Cleaning program. Their first impression is the one that will make the biggest impact - so make yours count! Patient satisfaction and HCAHPS scores. Infection Control through environmental surface cleaning, sanitation, and disinfecting strategies. Increased flexibility in Housekeeping Staffing Solutions. By outsourcing your Medical Cleaning and Hospital Cleaning Services you can relinquish the "cleanliness of the hospital environment" on your next HCAHP survey. Impact your patient's overall experience. A systematized approach that puts people first. Saftey compliance training for OSHA, HIPPA, & Bloodborne Pathogens. Going Green? 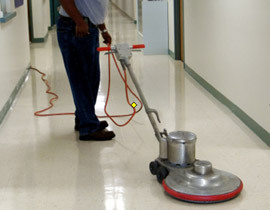 Let us help you design and implement a Hospital Green Cleaning Program.